We last left Jenny Lowthrop mid-mutton busting in Texas. 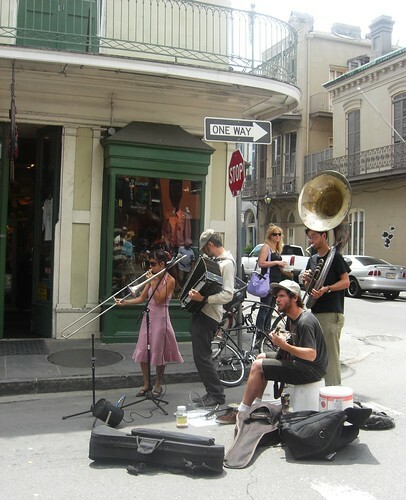 Continuing her USA Road Trip, Jenny enjoys a whistle-stop tour of New Orleans before heading to the home of Elvis: Memphis, Tennessee. We left the Mexican-influenced South and woke up in the French-influenced NOLA (New Orleans, Louisiana) and it just so happened to be the annual jazz and heritage festival! I am sure whenever you travel around the USA you are bound to come across a local festival, concert or celebration to enjoy with the locals. We headed to the French quarter for breakfast: pancakes, eggs five ways and crispy bacon piled high, all washed down with some cwaaffeee! The buildings were beautiful with outdoor wrought iron balconies just like in the movie Fried Green Tomatoes at the Whistle Stop Cafe. The small streets were filled with street performers, horse-drawn carriages, local artists, palm readers and unique little shops selling all sorts of trinkets and antiques. I can imagine it would be a lot of fun in the evenings too, with jazz filled bars selling hurricane and hand grenade cocktails, but time was running out before we had to give our car back. We had until 9pm to get to Memphis, which was approximately 500 miles away ... Back to driving! I wasn't sure what to expect with ‘N'Orlans’ but must say I was impressed and definitely want to return for Mardi Gras one day. Next stop: Gracelands, home of Mr Elvis Arran Presley – heard of him? At Gracelands we opted for the basic tour of the Gracelands abode, complete with trophy hut and audio tour for the grand total of $28. The house was pretty crazy: mirrors and carpets on the ceilings, indoor waterfalls, floor to ceiling psychedelic wallpaper, TV room, snooker room, jungle room! 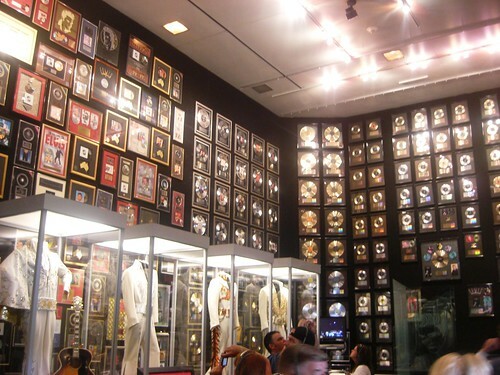 We headed on through to where the King recorded some of his songs and then we were on to the many, many, many walls of fame! This dude had a LOT of gold and platinum records, awards, wacky outfits … the works! The tour gave me a new found appreciation for Elvis. My image of him before was a scary looking middle aged dude with crazy sideburns, but hey, Elvis was HOT in his younger years. He fought for his country and gave a lot of his time and money to charities too. After our Elvis fix we put on our blue suede shoes – oops I mean cowboy boots and headed into Memphis City centre. This time we had moved from the jazz of New Orleans to the blues of Memphis. The streets were filled with blues bars and shops blaring out music. 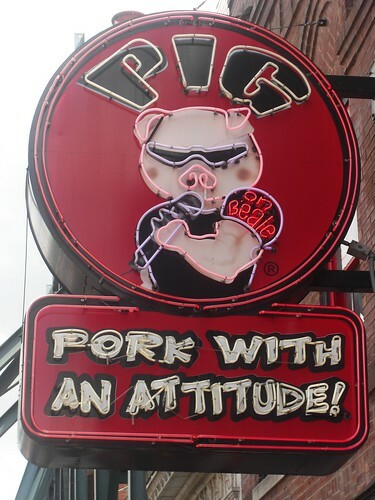 We stopped for some of the local delicacy of hickory glazed pork at the Pig Bar and Cafe (‘Pork with an attitude!’). They had won hundreds of awards for their spit roast pork and you can taste why! Alongside tasty pork and brilliant blues music Memphis is really known as the home of rock and roll. So do make sure you stop by Sun Studios where Elvis, Johnny Cash and many other famous artists recorded tunes. What else is Tennessee famous for? Why, Jack Daniels of course. So once you have had your fill of Elvis tunes and pork, wash it down with some delicious whisky from Lynchburg. The factory is an absolute must see. Until next time folks, @jlowthrop has left the building! Our expert consultants can help you plan your dream American road trip. Call 0208 045 4186 or visit in store.